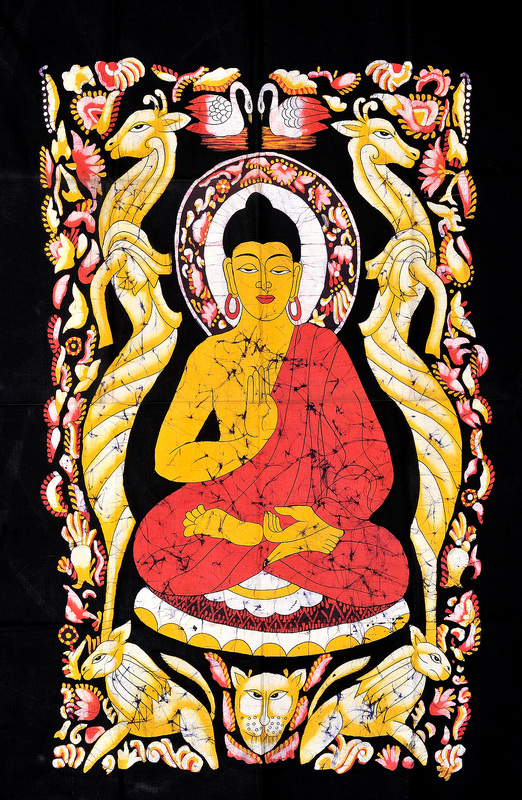 Shakyamuni, better known as Gautama Buddha was born into the royal clan of the Shakyas, whose emblem was the lion. He is thus also known as Shakyasimha, or the Lion of the Sakya lineage. Here we can see the symbolic lion-head gracefully delineated below the Buddha's seat of meditation. Buddha is surrounded in his immediate vicinity here by stylized elongated curvaceous forms of two deers, which merge into each other. Deers are often seen in Buddhist art surrounding peaceful deities. Their prime symbolic meaning refers to the first ever teaching Buddha gave after attaining enlightenment, in the Deer Park (mrigadawa) at Sarnath near Varanasi. Deers are by nature extremely shy creatures, and their peaceful presence in the aesthetic space represents a pure realm where fear is unknown. Above the central image of Buddha are a pair of swans, these too are rich in symbolism. The swan is believed to be capable of separating pure milk which has been mixed with water. This signifies their discriminating wisdom. In Buddhist art they are often shown in couples as in this painting. This indicates harmony, happiness, and fidelity. The whole composition is framed in light, unimposing flowering and vegetative creepers.